Ramadan is a month of worship for muslims and a cleansing time for their mind, body and soul. From sunrise to sunset, Muslims across the world are fasting without any food or drink. Intermittent fasting is one of the highest and most revered forms of worship in most religions and has become increasingly popular over the years within the health community. 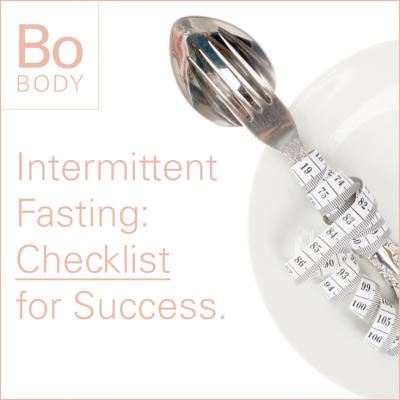 Intermittent fasting is a term for an eating pattern that is controlled within a set number of hours. Studies show that intermittent fasting has a wide range of health and beauty benefits from anti-aging, brighter complexion, detoxification, weight loss, increased metabolism, disease prevention, hormone regulation, better immunity, and longevity. Intermittent fasting should be avoided if you are pregnant or breastfeeding, or are dealing with low blood sugar where glucose and insulin levels have not been managed. Know your why. Starting a fast with a set of intentions can help you make powerful changes and give you a clear course toward your goals. Stay hydrated. Give your water a nutrient-boost by infusing with slices of lemon, cucumber, fresh mint and ginger. Aim to drink half your body weight (pounds) in ounces of water every single day. Eat your water. To help the body hydrate more efficiently add water-rich foods like cucumber, celery, lettuce, radishes, green bell peppers, watercress, lemons, cantaloupe, grapefruit, strawberries, and watermelon. Count colors not calories. Make a rainbow on your plate of reds, greens, yellows or oranges, and purples or blues. The more colorful you make your meal, the more nutrients you will consume. Aim for at least three colors at each meal to support healthy beauty. Eat more fiber. Fiber detoxes the body, lowers cholesterol, promotes regular elimination, balances blood sugar, feeds healthy gut bacteria, and creates a feeling of satiety. Fibrous foods such as fruits, vegetables, legumes, nuts, and whole grains stimulate the release of appetite-suppressing hormones, helping to curb your appetite between meals. Drink your greens. Smoothies are light, and an ideal vehicle for increasing fiber intake and energizing your cells. Liquified nutrients are easier to digest and assimilate. Not to mention, convenient. Green smoothies are as portable as a muffin or donut – but so much more beautifying. Commit to one green smoothie a day for 30 days. Click here to learn how to make a green smoothie. Eat healthy snacks. Try a handful of nuts, a banana with almond butter, or a chicken breast with sliced avocado sprinkled with sea salt and a squirt of lemon for those in-between meal snacks. Portion control. To help determine the right portion for each of the basic building blocks, let your hands be your guide. Click here for a handy portion control guide. Practice mindful eating. Properly chewing your food aids in better digestion. Since the signal of satiety takes approximately 20 minutes to be recognized by the brain, being mindful and chewing your food slowly will help to avoid over indulging. Eliminate processed foods. Processed foods are loaded with preservatives, chemical additives, synthetic dyes, and artificial flavorings, but skimp on beautifying ingredients. These ingredients trigger inflammation and cause an overload of free radicals in the body. Swap processed foods for fresh and natural foods to free up energy in your body to rejuvenate, repair and boost your overall health and beauty. Limit caffeine. Caffeine increases cortisol levels, causing wrinkles and belly fat, disrupts beauty sleep and is acidic to your body’s pH levels. Substitute regular tea and coffee with green tea, chamomile, peppermint, nettle, dandelion, Tulsi, or ginger tea. Green tea has caffeine but is loaded with antioxidants. Skip the sugar. Sweets made with refined sugar are more than just bad news for your waistline – sugar directly contributes to wrinkles, blemishes, dull skin, and cellulite. Eating sugar blocks the brains ability to effectively signal fullness and satiation, which could cause you to overindulge. When your body uses sugar for energy instead of fat, this makes weight loss difficult. Stock your pantry with healthier sweeteners instead such as stevia, raw honey, and coconut sugar, but still eat in moderation. Banish fried foods. Not only are fried foods high in fat; they’re often loaded with anti-beauty fat sources like cooked oils and trans fats. Oils that are heated to high temperatures become major sources of free radicals, which cause cellular damage resulting in wrinkles, inflammation, and head-to-toe beauty issues. Trans fats have been linked to obesity, high cholesterol, heart disease and hormonal imbalance. Journal. Journaling can help capture your inner most thoughts, provide inspiration and accountability, track exercise, record food, and act as a method to work toward personal development. Click here to download a sample template. Plan ahead. To offset mental indulgences that can be draining as well as distracting, pre-plan your daily meals. Using a menu planner and creating a shopping list can go a long way in making the preparation and cooking a simple process. Move your body. Exercise not only burns calories, but helps regulate appetite and fullness, thanks to a specific protein secreted by muscles when they contract. Aim for 30 to 60 minutes during feed hours or just before breaking your fast, five to six days a week with a combination of cardio, strength training and calming exercises in your workout routine. Train at an intensity of 60-80% of your maximum heart rate (MHR). To ensure you’re working within your THR range: Pause your activity, gently place two fingers on your pulse, count the number of beats for 10 seconds, then multiply this number by 6 to calculate your beats per minute. Purge the toxins. We are a society overloaded with toxins and over time, these toxins can accumulate in the body causing a range of symptoms from weight gain, joint pain, inflammation, headaches, skin issues, hormonal imbalances, depression, and premature aging. To help purge the body of any built-up toxins, soak in a hot bath of Epsom salts two or three nights a week. Go beyond the plate. Beyond nutrition, your breath, your thoughts, and the way you move, sleep, and feel are all forms of nourishment. Engage in activities you enjoy, have loving relationships with family and friends, give charity, be mindful, let go of anger, and practice gratitude. Strengthen your soul’s connection. At no other time is there a better opportunity to engage in spiritual growth than during a state of fasting. Be present with your soul and allow it to connect to its surroundings. Being “present” means that you are fully attuned to life and to what’s happening in the moment.